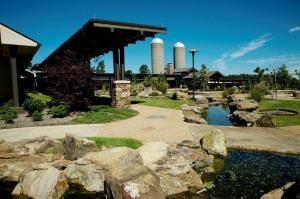 During Winthrop Rockefeller’s 20 years in Arkansas, he hosted hundreds of conferences and meetings at his innovative farm headquarters atop Petit Jean Mountain. In keeping with his passion to search for solutions, the Winthrop Rockefeller Institute is committed to creating an atmosphere where education, networking, and change can thrive. We aim to provide our guests with excellent customer service and a location that inspires critical thinking and constructive dialogue. With seven meeting rooms and breakout rooms, our Lodge and Conference Center is able to accommodate groups ranging from 10 to 275. In addition, three unique outdoor venues, including the boathouse and pavilions near serene Lake Abby, are equipped to handle day or evening events for up to 2,000 people. From barbecues at the boathouse to plated fine dining meals, the Rockefeller Institute can fulfill your culinary desires. Our culinary team is on hand to help you plan memorable meals for your group. If you are planning a meeting, a complete menu or a special buffet can be arranged.